Hottest Spot on the Rock! 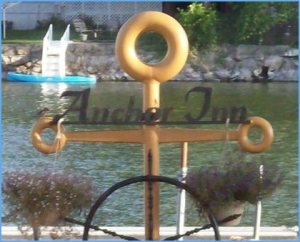 The Anchor Inn of Newville, WI, located just outside of Edgerton and right on the Rock River, with easy access from Lake Koshkonong. Whether you’re traveling by car or boat, there is ample parking in the lot or on the piers. We have a wonderfully diverse menu here at Anchor Inn. If you are stopping in for something to tide you over your appetizer menu includes mozzarella sticks, jalapeno poppers, onion rings, cheese curds, popcorn shrimp, clam strips and mushrooms. If you’re looking for a great sandwich, all of our burgers and steaks are cooked your way. Ask your server for our daily specials!!! Don’t miss our Friday Night Fish Fry and our Tuesday and Thursday Steak Fry.